When his mother became President, Alex Claremont-Diaz was promptly cast as the American equivalent of a young royal. Handsome, charismatic, genius--his image is pure millennial-marketing gold for the White House. There's only one problem: Alex has a beef with the actual prince, Henry, across the pond. And when the tabloids get hold of a photo involving an Alex-Henry altercation, U.S./British relations take a turn for the worse. OPRAHMAG.COM "30 of the Best LGBTQ Books That'll Change the Literary Landscape in 2019"
HYPABLE "Spring 2019 releases that need to be on your radar"
SHE READS "most anticipated Romances of 2019"
POPSUGAR "30 Must-Read Books of 2019"
BUZZFEED, "19 Books Coming Out This Year That You Seriously Need To Read"
BOOKRIOT "Best Books We Read in November" / "Love Is In The Air: 51 New Romance Novels Scheduled for 2019" / "Most Anticipated 2019 LGBTQ Reads" / "Most Anticipated Books of 2019" / 50 Must-Reads Books by Debut authors for January - June 2019"
BOOKPAGE "2019 preview: Most anticipated romance"
PUBLISHERS WEEKLY "Spring 2019 Announcements: Romance & Erotica Top 10"
GOODREADS "32 Big Books that YA Fans Can't Wait for in 2019"
BOOKBUB "The Best Romance Books Coming in 2019"
ALL ABOUT ROMANCE "Books We're Most Looking Forward to Reading This Year"
CHATELAINE MAGAZINE "Best Romance Books 2019"
DAZED MAGAZINE "Eight romance novels that are subverting the genre in 2019"
BOOKISH "Staff Reads: February 15"
THE WASHINGTON BLADE "Stonewall 50th inspires new books"
FOREVER YOUNG ADULT "Most Anticipated Books of 2019"
Casey McQuiston grew up in the swamps of Southern Louisiana, where she cultivated an abiding love for honey butter biscuits and stories with big, beating hearts. She studied journalism and worked in magazine publishing for years before returning to her first love: joyous, offbeat romantic comedies and escapist fiction. She now lives in the mountains of Fort Collins, Colorado, with a collection of caftans and her poodle mix, Pepper. 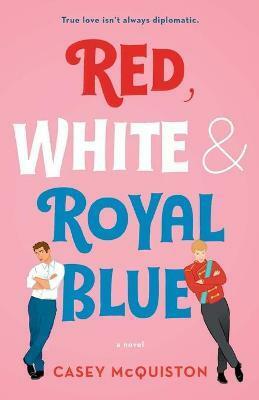 Red, White & Royal Blue is her first novel.